If you want to use the free version of AcyMailing, you can go to our download page and click on the button "Download". A popup will open asking you your Name and your E-mail and then, you will be able to download AcyMailing. Acyba.com only asks you your e-mail in order to keep you informed about important updates and security issues and we won't sell your personal data, nor spam you. 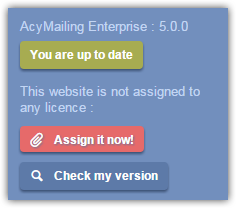 If you purchased AcyMailing, you can download the latest version of AcyMailing via the menu member area -> your subscription. 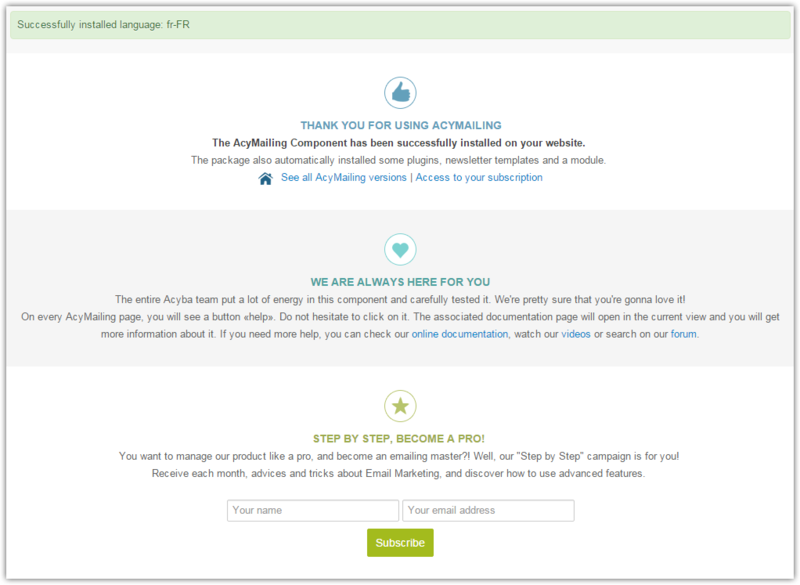 AcyMailing is a Joomla Component and like any other Joomla Component, it can be installed within two clicks! You don't have to extract the package first, AcyMailing will automatically install some plugins and a subscription module. Browse for your AcyMailing package and then click Upload & Install. 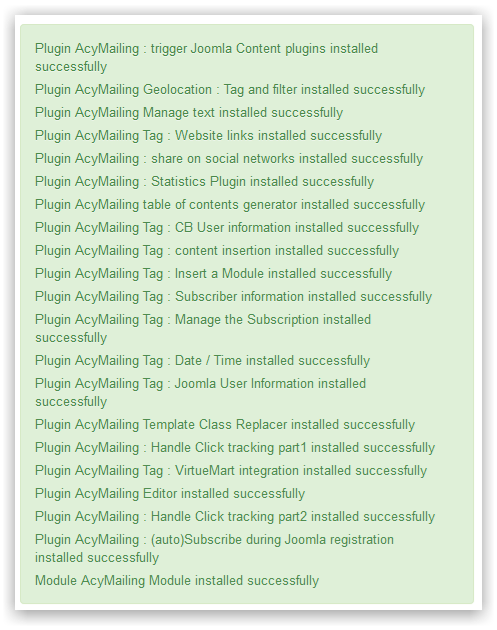 Joomla will upload the package on your server and install the AcyMailing component. This part can take more than 1 minute. Then AcyMailing will display a screen with the message "Please wait..." as AcyMailing will now redirect you to another screen in order to finalize the installation of the extension. AcyMailing will now automatically install its module, some plugins and some templates. AcyMailing will also install one default Mailing List and subscribe all your users to it so that you can directly create your first Newsletter and send it. AcyMailing finished the install process and you should now see a result of all installed extensions (Module, Plugins and Newsletter templates). If you have other languages installed, then AcyMailing will detect them and automatically installed the related language files. You are now ready to use AcyMailing! 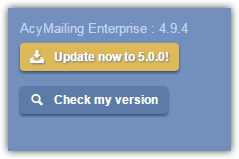 If you want to install the latest version of AcyMailing or upgrade to any commercial version, the upgrade process is as easy as the installation one! You don't have to uninstall AcyMailing. Simply process as explained above and install the new package via the Joomla Extensions manager and AcyMailing will be upgraded without losing any of your data. 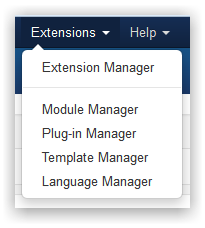 Log into the Joomla Administrator Section and click on the menu "Components" -> "AcyMailing" to access the AcyMailing Dashboard. At the end of the left-side menu, you will see a block telling you which version you have. You can check again your version and your licence. 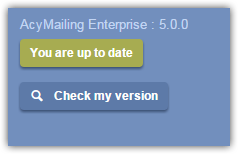 If your component is not up to date, a button will be displayed enabling you to download the latest version. Then download the package on your computer and install it via the Joomla installer (under the Extensions menu on the Joomla back-end), you don't have to uninstall the previous version! AcyMailing will be updated and you won't lose any of your data. If you use the Starter version, are on a local machine or have a valid licence attached to your website, then nothing will be displayed. 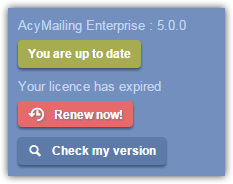 If you are on a server, using a commercial version and your licence is expired, a renew button will be displayed. If you are on a server, using a commercial version and your website is not attached to a licence, a button to attach your website to a licence will be displayed.